Australia should not give police or security information to Indonesia without a guarantee that it will not lead to people being shot to death under Indonesia’s capital punishment laws, CLA’s submission to the Joint Standing Committee on Treaties says. annually monitor how the human rights of West Papuans are being safeguarded, or otherwise. Note: On 26 Feb 07 President Dr Kristine Klugman, CEO Bill Rowlings and Director Dr June Verrier gave evidence to the inquiry (go to transcript). After the hearing, 2SER’s The Wire interviewed Mr Rowlings on the inquiry and CLA’s evidence (go to interview audio). 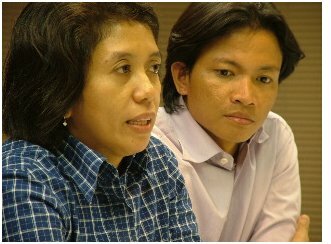 The 2SER interview also refers to the poisoned Indonesian activitist, Munir whose wife Suciwati also gave evidence before the Australian Parliamentary Committee. She is pictured in Canberra with Usman Hamid, head of Kontras, the Indonesian human rights agency which Munir founded.